Impressive growth, favorable macro conditions and a better appreciation of competitive strengths have all given U.S. and Chinese tech giants a lift this year. A week away from Christmas, Apple (AAPL - Get Report) ., Facebook (FB - Get Report) , Amazon.com (AMZN - Get Report) and Netflix (NFLX - Get Report) are each up over 50% on the year, and Alphabet /Google (GOOGL - Get Report) and Microsoft Corp. (MSFT - Get Report) are up over 35%. And China's two biggest tech firms, Alibaba (BABA - Get Report) and Tencent (TCEHY , are up over 95%. Can U.S. and Chinese tech giants hold onto or add to such massive gains next year? Provided macro conditions stay favorable, it's possible. While some of the run-ups feel a little stretched, we're still generally well-removed from the nosebleed levels of the Dot.com bubble. And until events happen that lead investors to seriously question their sales and profit expectations for these companies, the odds of a giant selloff happening don't feel especially high. This column has been updated from Nov. 25 to feature updated information on the 2017 gains posted by tech giants, along with additional commentary on their outlook going into 2018. A major economic slowdown would of course be at the top of the list of potential future events that could spawn a tech correction. But for now, with GDP growth steady, unemployment continuing to fall and both inflation and interest rates still fairly low, there are few reasons to bet on such a downturn happening in the near-term. As for industry-specific events that could weigh on the tech sector, there are some things that could have an impact, such as weaker smartphone demand, slower IT spending growth or a downturn for a booming memory industry. However, unless big secular trends such as high-end smartphone, e-commerce, cloud services and online ad adoption somehow hit a brick wall, the impact of industry-specific events are likely to be moderate. Arguably, the largest risk in the short-to-intermediate term isn't a slowdown per se, but that conditions get overheated -- both in terms of customer demand and stock price movements -- and ultimately yield a sharp correction that shakes investor confidence. The way in which this year's tech run-up has apparently drawn in a fair amount of "hot money" that's scared of getting left out of the fun is one potential warning sign. So might the fact that the latest earnings season saw strong numbers not only from companies that have been executing well and taking share, but also recent underperformers such as IBM (IBM - Get Report) and Seagate (STX - Get Report) . But for the time being, this is just something to monitor, rather than anything to get deeply worried over. Compared with the speculative frenzy and overheated corporate and telecom spending the tech sector in 1999 and 2000 -- or, for that matter, that frenzy that has come to surround anything cryptocurrency-related in recent months -- current tech conditions are relatively subdued. Heated, perhaps, but not in bubble territory. 1. Growth has been very strong, and in some cases accelerating. This almost goes without saying. Third-quarter earnings reports from the tech giants were impressive across the board, and often featured revenue growth rates that were at or near 2017 highs. Facebook, Google, Netflix and Amazon (excluding Whole Foods) respectively saw sales grow 47%, 22%, 30% and 29%, while Alibaba and Tencent each posted 61% growth. Apple and Microsoft "only" saw 12% growth, but also sport lower multiples than many of the faster-growing names (Apple particularly). Thanks to secular trends such as the shift in retail, ad and video spending towards online channels, as well as company-specific factors such as share gains and efforts to better monetize giant consumer platforms, life is clearly very good for the tech giants. 2. Plenty more growth is expected due to some key opportunities. Apple is expected to see decent 2018 growth with the help of an iPhone X-driven "supercycle" and decent services growth. Rising news feed ad prices, Instagram ad growth and the launch of serious attempts to monetize Messenger and WhatsApp are expected to keep Facebook's momentum going. Amazon is expected to take more share within an e-commerce market that itself is steadily taking share from physical retail, while also continuing to see strong AWS growth. Over in China, Alibaba and Tencent are expected to keep benefiting from a burgeoning Chinese middle class and various attempts to create more revenue from their most popular apps. And so on and so on. 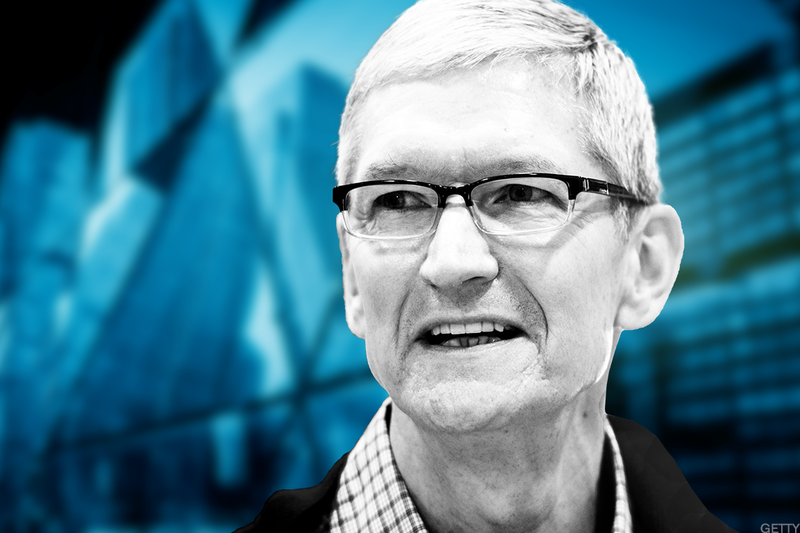 Heck of a year for Apple CEO Tim Cook. 3. Companies are increasingly seen as unassailable due to various moats. Markets seem to have gradually concluded that the tech giants deserve higher multiples due to the immense competitive advantages produced by their scale, resources, talent (and access to more of it) and ecosystems. Advantages that are both boosting growth and arguably diminishing the amount of long-term competitive risk the companies face. Right now, it hardly feels risky to assume Amazon's "flywheel" of Prime adoption, third-party seller growth and warehouse/logistics investments will continue driving share gains and margin growth. Or that Google and Facebook's will keep taking online ad share thanks to their unmatched scale, user data and targeting/measurement abilities. Or that Netflix will add tens of millions of more subscribers as its unmatched streaming subscriber base finances an unmatched original content budget and provides it with a ton of viewing data. Or that the R&D efforts of the tech giants in general won't continue to benefit from their ability to recruit and retain top-flight engineering talent that rivals often have a much harder time obtaining. 4. Macro conditions are mostly healthy. Fears of a major macro crisis occurring are pretty low right now. The eurozone debt crisis now feels like a distant memory, inflation remains under control and the unemployment rate continues trending lower. And while rising Chinese private debt loads have caused some concern, China has calmed worries about a major growth slowdown by continuing to post near-7% GDP growth. Like trend #3, macro optimism has contributed to multiple expansion by lowering the amount of risk investors feel bets on the tech giants (and for that matter, many other publicly-traded companies) carry. 5. There's limited growth elsewhere. When it comes to large-cap stocks at least, U.S. investors chasing double-digit growth generally don't have a ton of opportunities outside of tech. With both U.S. and global GDP growth expected to come in below 3% this year, tech is very much an outlier in terms of its revenue momentum. And markets definitely haven't failed to notice. Apple, Facebook, Alphabet and Microsoft are holdings in Jim Cramer's Action Alerts PLUS Charitable Trust Portfolio. Want to be alerted before Cramer buys or sells AAPL, FB, GOOGL or MSFT? Learn more now.